Bendigo Wholefoods has the largest assortment of gluten free foods in Bendigo, including take-home meals, frozen convenience foods, pastry sheets, dips, breads, bulk flours, nuts... and the list goes on. 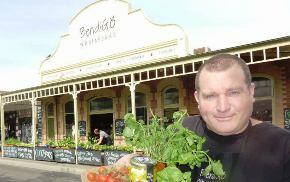 Bendigo Wholefoods specialises in local and global foods, breads, grocery lines, whole and bulk foods, nibbles, treats, meats, deli and dairy. There's even a Kitchen Garden section for home gardening needs. Located right next door is the recently opened Wholefoods Kitchen, a cafe with a large range of gluten free food to enjoy, both sweet and savoury. Bulk flours, nuts, seeds, quinoa, legumes, etc.